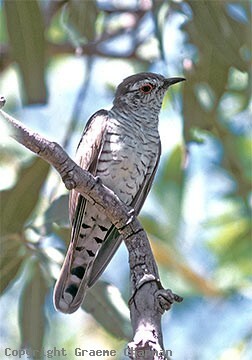 Little Bronze-Cuckoos range from near Broome in W. A. across tropical northern Australia and down the east coast of Queensland to NE NSW with the odd vagrant further south. 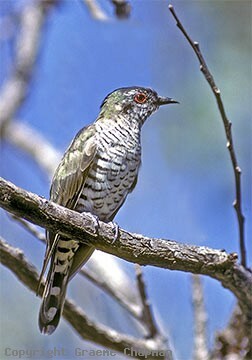 However, between Rockhampton and Cape York the very similar Gould's Bronze-Cuckoo also occurs, albeit in different habitats. A lot has been written about these two very similar forms, mostly conjecture, about whether they are species or subspecies. For closeups of the two (males) look at pics #s 345208 and 345209D. I follow HANZAB and treat them as species. In areas where both occur, they appear to occupy different habitats and as a consequence, parasitise different hosts. In this respect very few accurate records exist, mainly because of the difficulty in separating the Little from Gould's but also in most cases, no effort was made to record which bird was involved because they are often simply regarded as subspecies. Most of the recorded hosts have been gerygones of one sort or another; in W.A. Large-billed and Dusky and in eastern Australia, Large-billed, Mangrove and White-throated. When at the Glasshouse Mountains in southern Qld. we lived on the edge of dry eucalypt forest and White-throated Gerygones frequented the garden. A few years ago we watched a Little Bronze-Cuckoo visit the gerygones' nest but exactly what happened was not clear. I say Little Bronze because I didn't consider Gould's; they aren't supposed to be here near Brisbane, so strictly speaking this can't be used as a factual record - one of these days someone will find a Gould's near Brisbane. 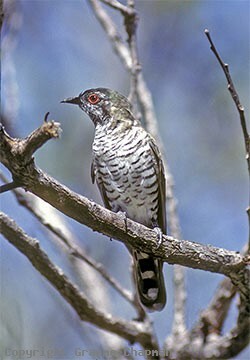 In SE Qld and NE NSW the subspecies "barnardi" (345210D) of the Little Bronze-Cuckoo is migratory. Most records are made in Spring - they probably stay until the end of Summer but because the breeding season is essentially finished, they sing very little. Very few observations are ever made of females - they are very quiet birds. Females look quite different - the eye-ring is pale green or yellow instead of red and the eye itself isn't red either; both brown and 'dirty cream' have been recorded. However in photo # 345205D which I took recently near Darwin the bird has an orange eye-ring and a brown eye. The Handbook of Birds of W.A. says the female has an orange eye-ring! contrary to HANZAB. In northern Australia the other subspecies "minutillus" which occurs in Australia is found throughout the year. 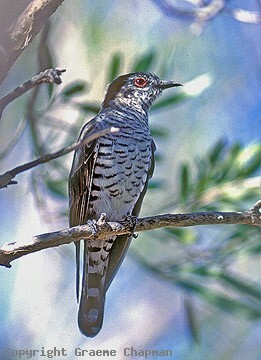 345201 ... Little Bronze-Cuckoo, male from near Broome, W.A.